The new-ish location for Bestival in Lulworth Estate, Dorset was beautiful. The elegant castle added to the classy and fun vibe of the event. The layout, style and line-up reminded me of Secret Garden Party: the focus was on the overall feel and there seemed to be an encouragement to explore, living in the moment, rather than spending the weekend constantly chasing big name acts. That’s definitely not to say there weren’t any big acts though! Some of the huge names that performed included Grace Jones, London Grammar, Rudimental, Chaka Khan and M.I.A. to name a few. These acts were coupled with lots of smaller stages and activities so there was never a dull moment. The event this year was clearly not a sell out as tickets were still available in the week leading up to the event. We were definitely thankful for the space around the campsite and (slightly) shorter queues for the toilets; with only 2 sets of loos on the campsite any more people and they would have been unbearable with the heat! There was an eclectic mix of people of all ages, however few children thanks to Camp Bestival having occurred the weekend before which is hailed as the more child friendly of the two events. Everybody at Bestival was incredibly welcoming and friendly, we didn’t hear a negative word all weekend! It was clear that all the people definitely wanted to be there to have a good time. We arrived early Saturday morning and after setting up camp we went exploring. There were so many things to gaze at as you strolled around the site; a giant disco ball was the first thing we came to, glistening in the bright sunshine by the Big Top stage. Further round near Caravanserai was another huge silver sparkling decoration this time spelling out I <3 Bestival. The well-known Bestival robot greeted us round the next bend and we also discovered a tasselled rainbow, they definitely delivered on the giant decorations! We decided to grab some food and went to the area located behind the castle. There we found individual food stalls and The Feast Collective tent full of even more delightful options. In here we discovered edible shot bubbles; clear bubbles made of seaweed filled with a cocktail shot. They were very unusual, but that’s exactly the sort of thing I’d hoped to find at a festival such as Bestival! Looking around the tent for food there was something for everyone including plenty of vegan options. I’d heard of Biff’s Jack Shack before so had to have a try of their pulled jackfruit burgers, even in the heat they were thoroughly enjoyed. Later in the afternoon, while still exploring, we heard a familiar beat and went to find out who and where it was. 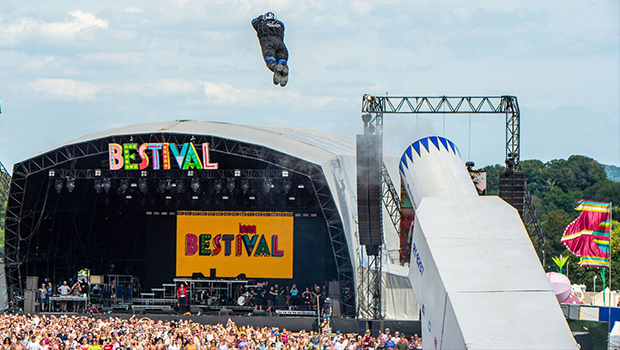 Rounding a corner we found the HMS Bestival stage with So Solid Crew playing. Having started a little early the crowd was moderate to begin with but it filled up within minutes. The speakers were thumping as everybody danced away with the sun still hot but very pleasant. We also explored some other stages that afternoon such as House of Vans and Stacey’s, each of which had a very different and unique setup inside. We also saw a queue of people getting colourful hair plaits, found a place to print your photo on a t-shirt for free and plenty of spaces to chill out. Rock your day sponsored one of these such areas: it felt like an untapped resource, looking like a VIP area put people off from coming in but in fact it was free for all to enter, they offered shelter from the sun with stylish seating, bar and a DJ. There was so many things to do, you’d find it hard to be bored! Also that afternoon we had go on the highly anticipated World’s Biggest Bouncy Castle which as hailed to fit up to 100 people! The cost of £4 for 10 minutes clearly put some people off as it was not very busy when we got on, however this was all the better for us. It was large enough to have races over and definitely the most bouncy of castles I’ve ever been on. The feeling of nostalgia was immense as you felt like a tiny child again on the ginormous inflatable. The session flew by but probably for the best as when we got off we were both quite tired from all the bouncing and excitement. Also on Saturday afternoon we discovered a slightly unusual band called Elvana: a hybrid of Elvia and Nirvana. The crowed filled the space under The Big Top and began to spread out into the surrounding open space. This is no surprise considering how well they managed to combine the two music styles. One song began with Evlis’ ‘Heart shaped box’ and, both beautifully and seamlessly, managed to gradually switch to Nirvana’s ‘Nevermind’. The lead singer Elvis Cobain was dressed in a fabulous Elvis style suit to add to the theatre of the whole performance and the live band accompanying him created a powerful atmosphere of excitement. 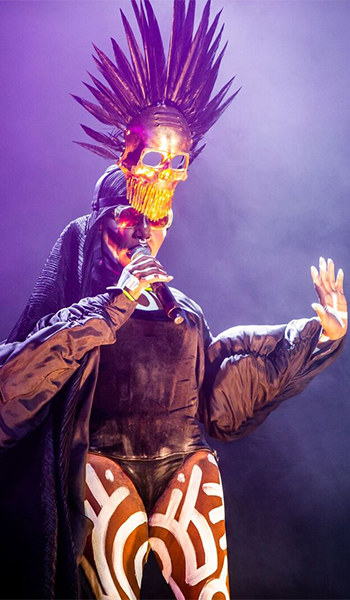 Later that evening, seeing the icon herself, Grace Jones, was a sure highlight of the festival. Considering the model/singer is now 70 she put on an incredible performance dancing all over the stage in elaborate headpieces and body paint. The crowd filled the Main Stage area and beyond. The huge confetti cannon further added to the excitement and extravagance of her performance. She shows that she is in fact a, Slave to the Rhythm, as she effortlessly hula hooped all the way through it! Perfectly timed, following on from Grace Jones was an incredible firework and visual display on Lulworth Castle itself. Carefully animated graphics made the castle come alive and a wonderful fireworks display lit up the sky. The excitement among the crowd was undeniable. 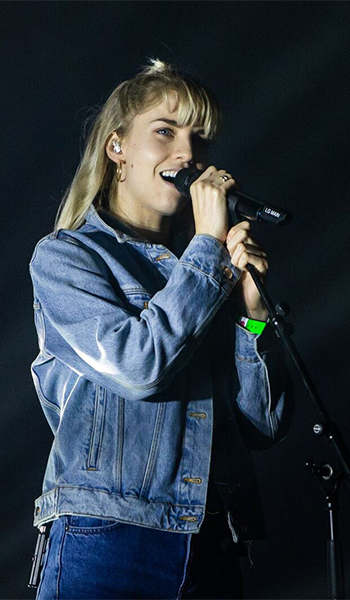 London Grammar were up next, their lead singer Hannah Reid’s delivered a fantastic performance opening with “Hey Now.” but for some the pace was a bit too slow for the time scheduled. Perhaps they should have swapped with So Solid Crew?! We however all took a moment to boo a man in unison who thought it was a good to climb up a tree behind me. So there was some excitement! On Sunday, after some breakfast, we delved further into the mystery and awe of Bestival by uncovering and exploring some of the more hidden and discreet areas of the festival site. In the afternoon we stepped through the rugged looking exterior of Caravanserai and found an abandoned funfair themed oasis. In here we also discovered a wonderful cocktail bar, something we had been looking for since we arrived, serving both traditional drinks like espresso martini as well as more unique drinks like a blood orange paloma (both were equally delicious). The space included 2 small stages, toilets and a stall serving scrumptious vegan hot dogs. Seating around the area was plentiful and made using rusty old seats from spinning cup rides and old caravans. Nestled among the trees and in an enclosed area there was also ample shade to recover from the sun, very much needed by the time Sunday came around. We also paid a visit to Rob and Josie’s Gin Festival which was a feast to the eyes of any gin lover. We stayed in here for a while and made peace with mother’s ruin. We do recommend finding yourself a festival map as some of these little gems could be easily missed. I personally invest in a paper program as I always seem to run my phone battery flat at festivals. So take note of charging points as well, we definitely spotted a few scattered around the site. If you wanted to get yourself moving and active there were also lots of physical activities on too. We saw a groups of people running, which we later found out was called the Bestival 5k and ‘ran’ every morning. In Slow Motion was saw a Bollywood dance class and Acro-yoga. We even tried our hand, or should I say fully body, at disco yoga under The Big Top. Each activity was run at a pace allowing people of any ability to join in, further continuing the inclusive and accepting values of the whole festival experience. Sunday evening was when the festival line-up really heated up. Jaguar Skills had everybody jumping and dancing around HMS Bestival just before 7pm, pleasantly just as the sun began to cool slightly. Dust was pummelled up into the air as people moved to the beat of his ever changing music, splicing together many well-known tracks in unusual combinations. Also playing at the same time at The Big Top were The Dutty Moonshine Big Band who had a live band, including trumpets and trombones, playing drub and bass. The sound from the live band had incredible depth, filling the tent with raw and powerful sound. To be honest they were the highlight for me. As with every Bestival I discover a new gem and this was it. You can download some of their tracks HERE for for free. So go nuts! Finally, the last big act of the night was Rudimental who, despite only playing a DJ set, pulled a crowd at least the size of that at Grace Jones. Considering their set finished at midnight on Sunday this was no mean feat. The Temple stage was perfect for their performance; nestles in the dip of a hill allowed viewers from far away to still see the colourful strobes and fireworks going off to the music. Playing many of their well-known tracks had everybody dancing through the whole set, we were glad we had taken Monday off to see their performance. What a way to end such an incredible weekend!